The grace of Christ poured forth like a spring of blood. 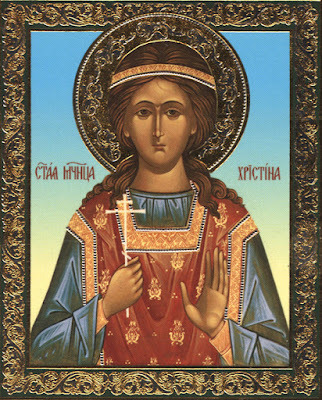 For her unwavering confession of faith in Christ, Christina was cruelly tortured in Persia in the sixth century during the reign of King Chosroes I. So much did they torture her, flogging her with a whip, that she became weak and died. Her soul then departed from her tortured body and entered into the joy of Christ, the King and Lord.